6 Ft. Mission Park Recycled Plastic Bench with Steel Frame - 362 Lbs. This 6 ft. Mission Park recycled plastic bench with steel frame offers style and durability for high traffic areas, such as parks and schools. 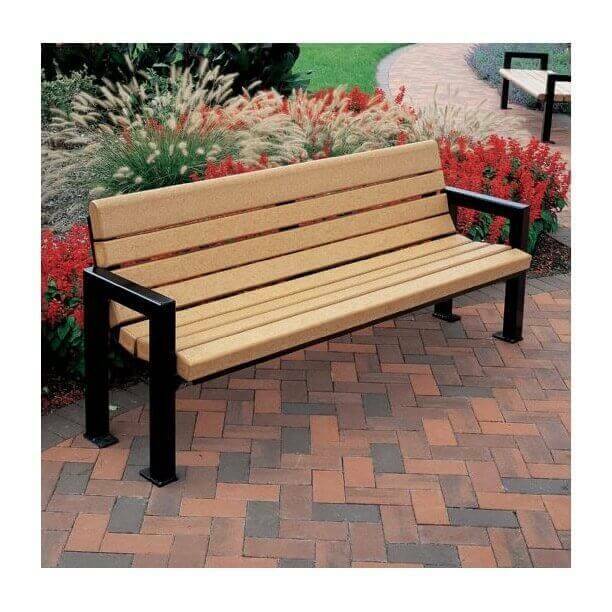 Made with commercial grade recycled plastic cedar-colored slats and a quality black powder-coated frame, this bench will bring many years of low maintenance service without rot, rust, or fade. Ships fully assembled with stainless steel hardware fastened, ready for secure surface mount installation. This product is made in the USA and is supported by our 5-year commercial warranty. Mounting hardware for surface mount not included. 32 Gallon Recycled Plastic Circular Receptacle with Steel Frame - 145 Lbs.